Thailand’s hot season, which felt hotter than normal this year but according to the weather service was not, is just winding up. One of the few positives to the hot season is that many restaurants serve a seasonal specialty known as khao chae (ข้าวแช่). Tawn and I joined a few friends to sample this delicacy. Making khao chae is a three-day process. The rice is parboiled, which leaves it with a “toothier” texture than is typical for jasmine rice. It is then soaked with jasmine petals in a container that has lit jasmine candles floating in it. The delicate floral flavor permeates the rice. Finally, the rice is served in ice water, a cool treat during hot season. The side dishses are the real attraction, though. They vary depending on the house’s specialties but what you see above is pretty typical. 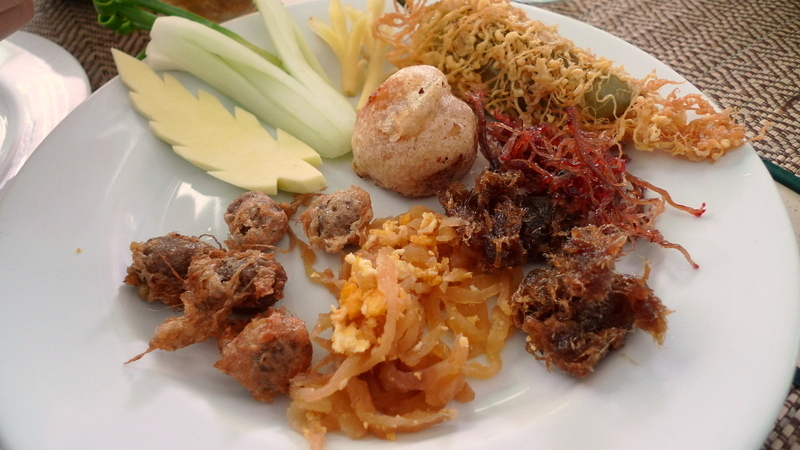 It includes (working clockwise) elaborately carved green mangoes, cucumbers, grachai (fingerroot), hua hom yat sai (fried stuffed red onion), prik yuan sod sai (young banana peppers stuffed with pork and wrapped in a crispy, eggy shroud), muu wan (sweet dried shredded beef), plaa wan (sweet dried shredded fish), pad hua chai po (thin strands of dried pickled radishes stir-fried with egg), and luk kapi pad (fried fermented shrimp paste balls). 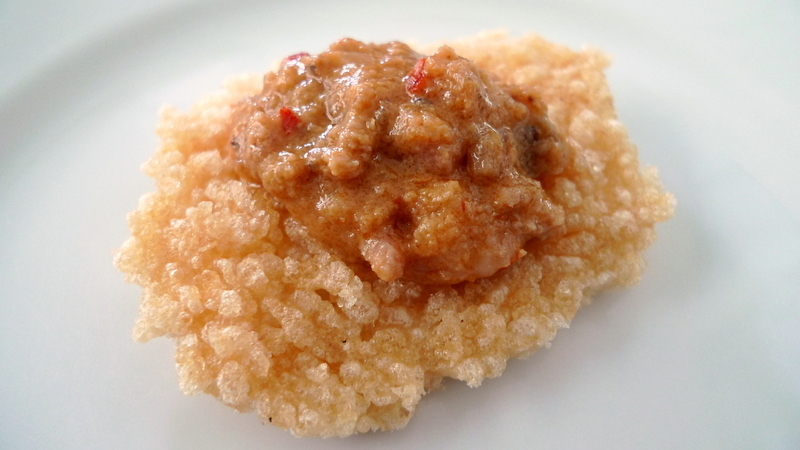 khao tang na tang – Fried rice cracker with a minced pork and peanut topping. khanom pang na gung – little toasts with shrimp pate and sesame seeds served with plum sauce. 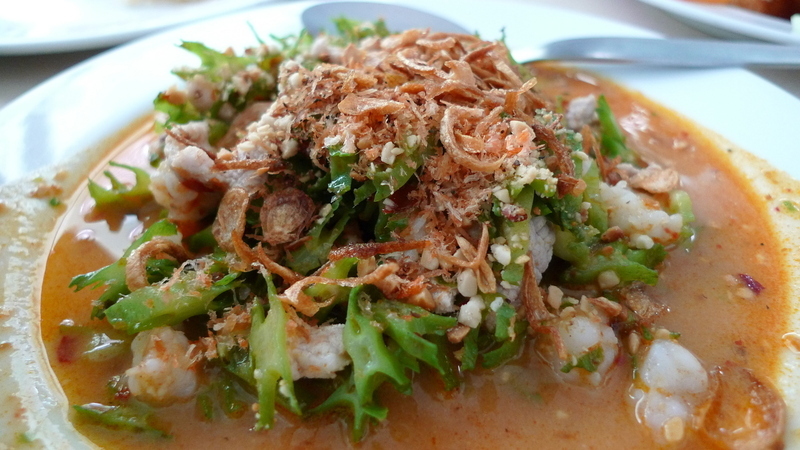 yam tua pluu – a spicy salad of wing beans and toasted shallots with a peanut and roasted chili dressing. For dessert, I had a less-common dish called khao maow grob. 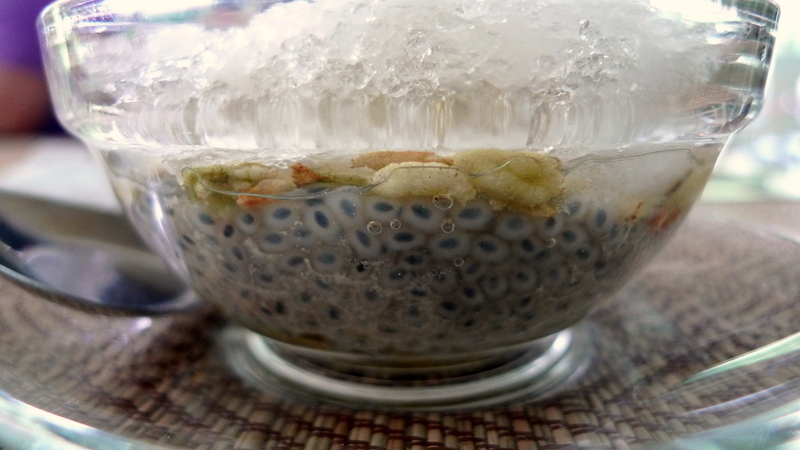 It features grains known as meang lak (hydrated lemon basil seeds) served with syrup and crushed ice, topped with toasted rice grains coated with palm sugar. 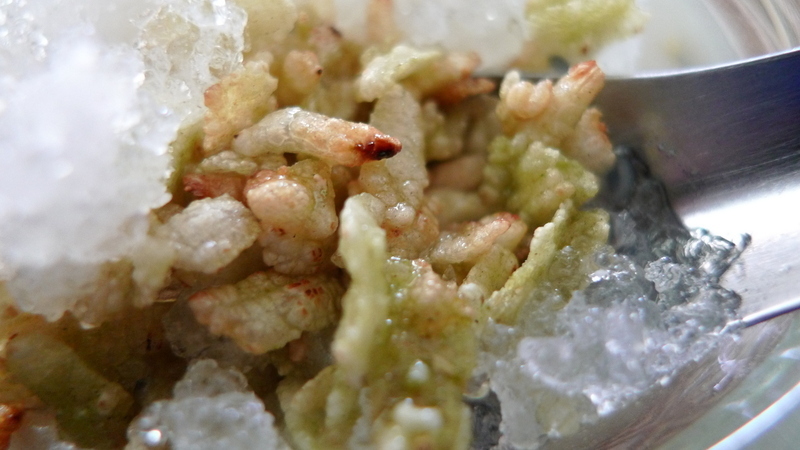 Here’s a close up of the palm sugar coated toasted rice grains. Just like very crunch Rice Krispies. One of the more interesting Thai desserts I’ve had. The meal was a refreshing break from our hot weather. Thankfully, by the time I’ve gotten around to writing this, rainy season has started to arrive and the heat is breaking. 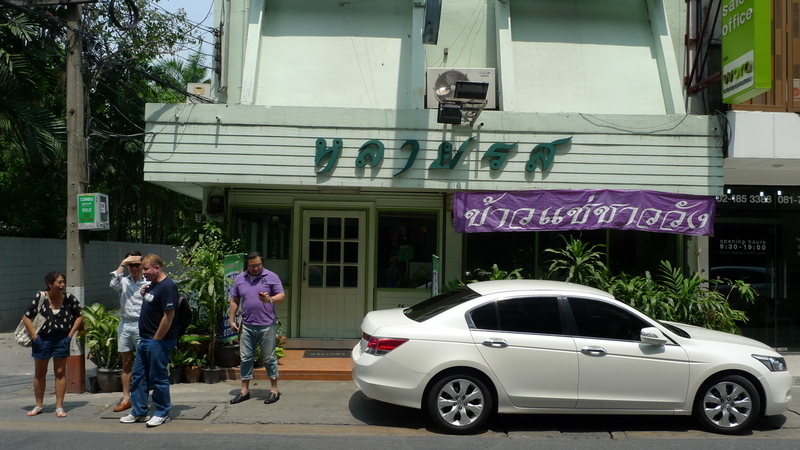 This entry was posted in Uncategorized and tagged food, Jasmine, KhaoChae, Restaurant, rice, thai, Thailand by christao408. Bookmark the permalink. I agre. The toast with sesame seeds and shrimp pate sounds good. With the exception of the yam tua pluu it all looks good! I am really fascinated by the dessert – how did it taste?? Overwhelming. Stuff of dreams.Sorry, rec doesn’t work for me. Not sure about the cold rice – I will have to check that out the next time I go to our local Thai Restaurant. But the rest yes yes yes! I don’t think I’ve ever seen this at the Thai restaurants I go to. It looks very interesting and I would love to try it. Thai food never fails to excite and satisfy my tastebuds. I’d like to try the wing beans salad first among these. I use meang lak in the drinks I make at home in summer. The drinks are non alcoholic, and are cold and very refreshing. 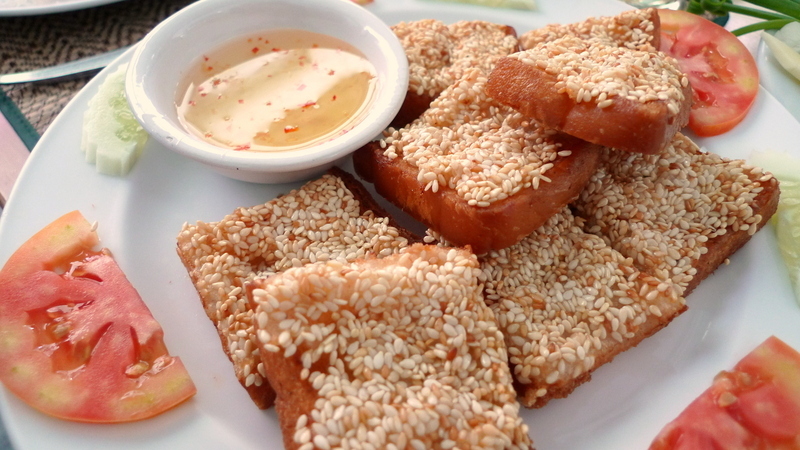 I have served the shrimp paste toast squares with the sesame seeds. Everyone’s favorite.I have never seen or tried the cold jasmine rice. I would love to try it though.As usual, a great post. quite an interesting meal! at first, i expected the jasmine rice dish to be a sweet dessert, but i guess not…. i imagine it would be quite good with a very delicate sweet (fruit-based?) syrup of some kind, or with diced fresh local fruits. mm… can you tell i’m hungry? I had that desert once. Those grains I actually found frightening. 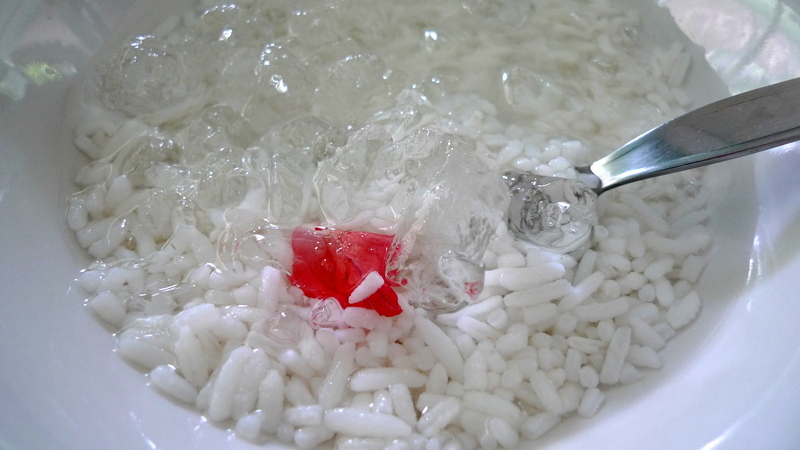 icy cold jasmine rice that is not even a dessert? interesting.